This article assumes a general, non-technical familiarity with the scientific theory of Chaos. See James Gleick’s book, Chaos: making a new science (1987). This field of study is not usually discussed in the context of “The Law,” although there is a small body of literature outside of e-discovery. See: Chen, Jim, Complexity Theory in Legal Scholarship (Jurisdymanics 2006). A key leader in the Chaos Theory field is the late great French mathematician, Benoit Mandelbrot (1924-2010) (shown right). Benoit, a math genius who never learned the alphabet, spent most of his adult life employed by IBM. He discovered and named the natural phenomena of fractals. He discovered that there is a hidden order to any complex, seemingly chaotic system, including economics and the price of cotton. He also learned that this order was not causal and could not be predicted. He arrived at these insights by study of geometry, specifically the rough geometric shapes found everywhere in nature and mathematics, which he called fractals. The penultimate fractal he discovered now bears his name, The Mandelbrot Fractal, shown in the computer photo below, and explained further in the video that follows. 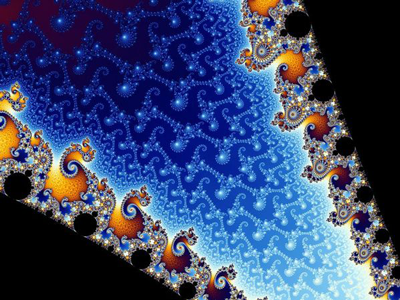 Look here for thousands of additional videos of fractals with zoom magnifications. You will see the recursive nature of self-similarity over varying scales of magnitude. The patterns repeat with slight variations. The complex patterns at the rough edges continue infinitely without repetition, much like Pi. They show the unpredictable element and the importance of initial conditions played out over time. The scale of the in-between dimensions can be measured. Metadata remains important in all investigations, legal or otherwise. The Mandelbrot is based on a simple mathematical formula involving feedback and Complex Numbers: z ⇔ z2 + c. The ‘c’ in the formula stands for any Complex Number. Unlike all other numbers, such as the natural numbers one through nine – 1.2.3.4.5.6.7.8.9, the Complex Numbers do not exist on a horizontal number line. They exist only on an x-y coordinate time plane where regular numbers on the horizontal grid combine with so-called Imaginary Numbers on the vertical grid. A complex number is shown as c= a + bi, where a and b are real numbers and i is the imaginary number. A complex number can be visually represented as a pair of numbers (a, b) forming a vector on a diagram called an Argand diagram, representing the complex plane. “Re” is the real axis, “Im” is the imaginary axis, and i is the imaginary number. And that is all there is too it. Mandelbrot calls the formula embarrassingly simple. That is the Occam’s razor beauty of it. To understand the full dynamics of all of this remember what Imaginary Numbers are. They are a special class of numbers where a negative times a negative creates a negative, not a positive, like is the rule with all other numbers. In other words, with imaginary numbers -2 times -2 = -4, not +4. Imaginary numbers are formally defined as i2 = −1. Thus, the formula z ⇔ z2 + c, can be restated as z ⇔ z2 + (a + bi). The Complex Numbers when iterated according to this simple formula – subject to constant feedback – produce the Mandelbrot set. The value for z in the iteration always starts with zero. The ⇔ symbol stands for iteration, meaning the formula is repeated in a feedback loop. The end result of the last calculation becomes the beginning constant of the next: z² + c becomes the z in the next repetition. Z begins with zero and starts with different values for c. When you repeat the simple multiplication and addition formula millions of times, and plot it on a Cartesian grid, the Mandelbrot shape is revealed. When iteration of a squaring process is applied to non-complex numbers the results are always known and predictable. For instance when any non-complex number greater than one is repeatedly squared, it quickly approaches infinity: 1.1 * 1.1 = 1.21 * 1.21 = 1.4641 * 1.4641 = 2.14358 and after ten iterations the number created is 2.43… * 10 which written out is 2,430,000,000,000,000,000,000,000,000,000,000,000,000,000. A number so large as to dwarf even the national debt. Mathematicians say of this size number that it is approaching infinity. The same is true for any non-complex number which is less than one, but in reverse; it quickly goes to the infinitely small, the zero. For example with .9: .9.9=.81; .81.81=.6561; .6561.6561=.43046 and after only ten iterations it becomes 1.39…10 which written out is .0000000000000000000000000000000000000000000000139…, a very small number indeed. With non-complex numbers, such as real, rational or natural numbers, the squaring iteration must always go to infinity unless the starting number is one. No matter how many times you square one, it will still equal one. But just the slightest bit more or less than one and the iteration of squaring will attract it to the infinitely large or small. The same behavior holds true for complex numbers: numbers just outside of the circle z = 1 on the complex plane will jump off into the infinitely large, complex numbers just inside z = 1 will quickly square into zero. The magic comes by adding the constant c (a complex number) to the squaring process and starting from z at zero: z ⇔ z² + c. Then stable iterations – a set attracted to neither the infinitely small or infinitely large – become possible. The potentially stable Complex numbers lie both outside and inside of the circle of z = 1; specifically on the complex plane they lie between -2.4 and .8 on the real number line, the horizontal x grid, and between -1.2 and +1.2 on the imaginary line, the vertical y grid. These numbers are contained within the black of the Mandelbrot fractal. In the Mandelbrot formula z ⇔ z² + c, where you always start the iterative process with z equals zero, and c equaling any complex number, an endless series of seemingly random or chaotic numbers are produced. Like the weather, the stock market and other chaotic systems, negligible changes in quantities, coupled with feedback, can produce unexpected chaotic effects. The behavior of the complex numbers thus mirrors the behavior of the real world where Chaos is obvious or lurks behind the most ordered of systems. With some values of ‘c’ the iterative process immediately begins to exponentially increase or fall into infinity. These numbers are completely outside of the Mandelbrot set. With other values of ‘c’ the iterative process is stable for a number of repetitions, and only later in the dynamic process are they attracted to infinity. These are the unstable strange attractor numbers just on the outside edge of the Mandelbrot set. They are shown on computer graphics with colors or shades of grey according to the number of stable iterations. 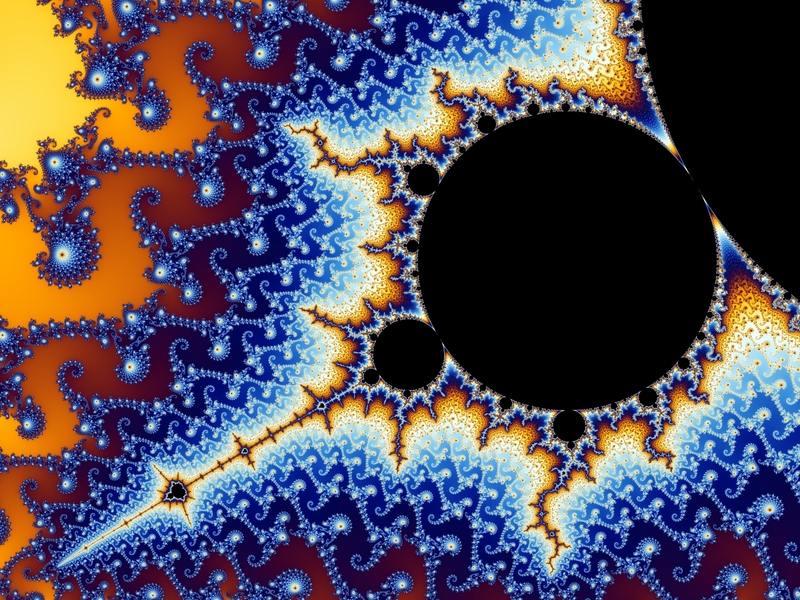 The values of ‘c’ which remain stable, repeating as a finite number forever, never attracted to infinity, and thus within the Mandelbrot set, are plotted as black. Some iterations of complex numbers like 1 -1i run off into infinity from the start, just like all of the real numbers. Other complex numbers are always stable like -1 +0i. Other complex numbers stay stable for many iterations, and then only further into the process do they unpredictably begin to start to increase or decrease exponentially (for example, .37 +4i stays stable for 12 iterations). 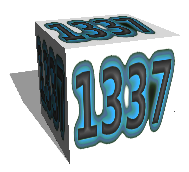 These are the numbers on the edge of inclusion of the stable numbers shown in black. Chaos enters into the iteration because out of the potentially infinite number of complex numbers in the window of -2.4 to .8 along the horizontal real number axis, and -1.2 to 1.2 along the vertical imaginary number axis. There are an infinite subset of such numbers on the edge, and they cannot be predicted in advance. All that we know about these edge numbers is that if the z produced by any iteration lies outside of a circle with a radius of 2 on the complex plane, then the subsequent z values will go to infinity, and there is no need to continue the iteration process. By using a computer you can escape the normal limitations of human time. You can try a very large number of different complex numbers and iterate them to see what kind they may be, finite or infinite. Under the Mandelbrot formula you start with z equals zero and then try different values for c. When a particular value of c is attracted to infinity – produces a value for z greater than 2 – then you stop that iteration, go back to z equals zero again, and try another c, and so on, over and over again, millions and millions of times as only a computer can do. 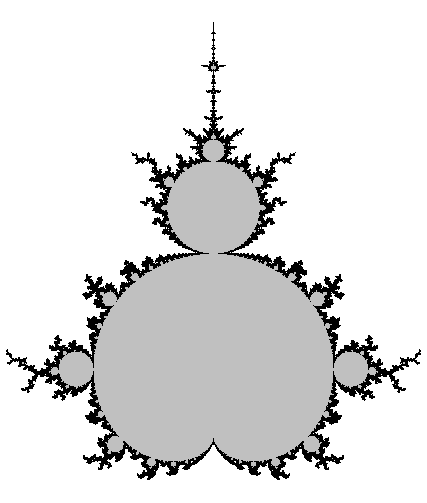 Mandelbrot was the first to discover that by using zero as the base z for each iteration, and trying a large number of the possible complex numbers with a computer on a trial and error basis, that he could define the set of stable complex numbers graphically by plotting their location on the complex plane. This is exactly what the Mandelbrot figure is. Along with this discovery came the surprise realization of the beauty and fractal recursive nature of these numbers when displayed graphically. The following Numberphile video by Holly Krieger, an NSF postdoctoral fellow and instructor at MIT, gives a fairly accessible, almost cutesy, yet still technically correct explanation to the Mandelbrot set. Anther Chaos Theory instructional applying the insights to psychology is worth your view. The Science and Psychology of the Chaos Theory (8:59, 2008). It suggests the importance of spontaneous actions in the moment, the so-called flow state. Also see High Anxieties – The Mathematics of Chaos (59:00, BBC 2008) concerning Chaos Theories, Economics and the Environment, and Order and Chaos (50:36, New Atlantis, 2015). The use of feedback, iteration and algorithmic processes are central to work in electronic discovery. For instance, my search methods to find relevant evidence in chaotic systems follow iterative processes, including continuous, interactive, machine learning methods. I use these methods to find hidden patterns in the otherwise chaotic data. An overview of the methods I use in legal search is summarized in the following chart. As you can see, steps four, five and six iterate. These are the steps where human computer interactions take place. My methods place heavy reliance on these steps and on human-computer interaction, which I call a Hybrid process. Like Maura Grossman and Gordon Cormack, I rely heavily on high-ranking documents in this Hybrid process. The primary difference in our methods is that I do not begin to place a heavy reliance on high-ranking documents until after completing several rounds of other training methods. I call this four cylinder multimodal training. This is all part of the sixth step in the 8-step workflow chart above. The four cylinders search engines are: (1) high ranking, (2) midlevel ranking or uncertain, (3) random, and (4) multimodal (including all types of search, such as keyword) directed by humans. Recall Mandelbrot’s formula: z ⇔ z² + c, which is the same as z ⇔ z2 + (a + bi). I have something like that going on in my steps four, five and six. If you plugged the numbers of the steps into the Mandelbrot formula it would read something like this: 4 ⇔ 4² + (5+6i). The fourth step is the key AI Predictive Ranking step, where the algorithm ranks the probable relevance of all documents. The fourth step of computer ranking is the whole point of the formula, so AI Ranking here I will call ‘z‘ and represents the left side of the formula. 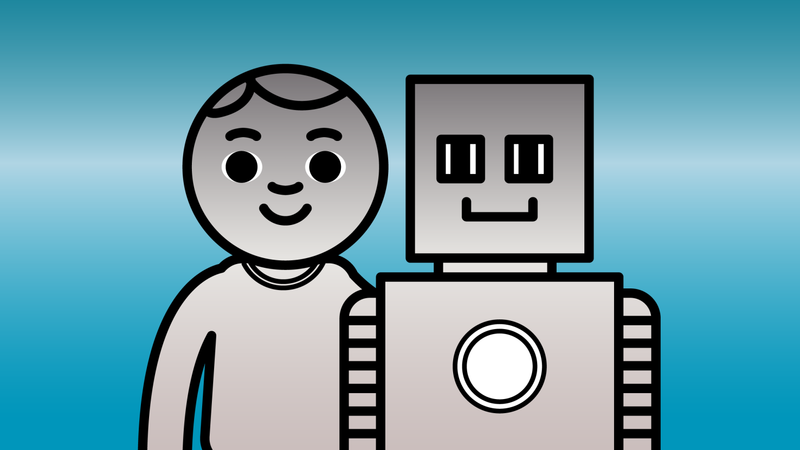 The fifth step is where humans read documents to determine relevance, let’s call that ‘r‘ and the sixth step is where human’s train the computer, ‘t‘. 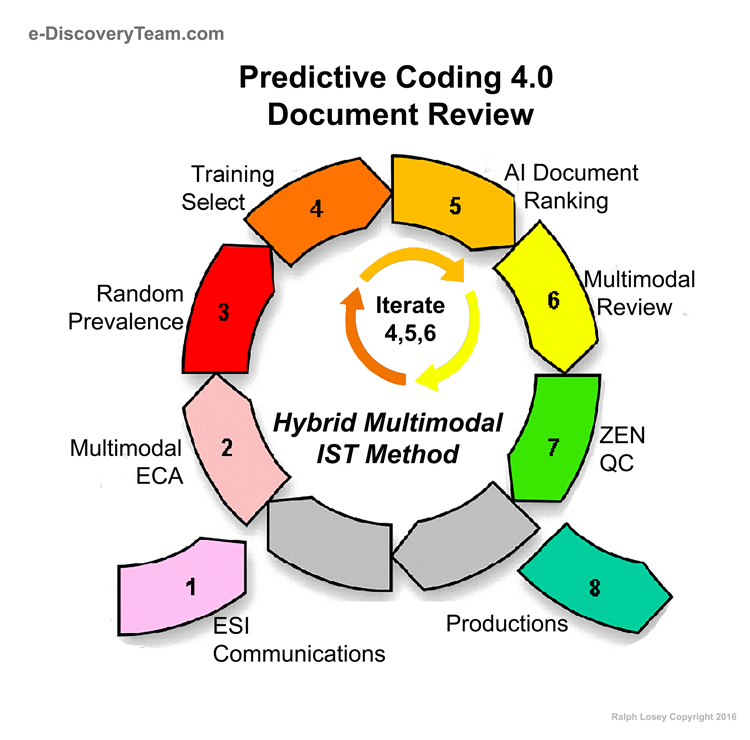 This is the Hybrid Active Training step where the four cylinder multimodal training methods are used to select documents to train the whole set. The documents in steps five and six, r and t are added together for relevance feedback, (r + ti). Thus, z ⇔ z² + c, which is the same as z ⇔ z2 + (a + bi), becomes under my system z ⇔ z + (r + ti). (Note: I took out the squaring, z², because there is no such exponential function in legal search; it’s all addition.) What, you might ask, is the i in my version of the formula? This is the critical part in my formula, just as it is in Mandelbrot’s. The imaginary number – i – in my formula version represents the creativity of the human conducting the training. The Hybrid Active Training step is not fully automated in my system. I do not simply use the highest ranking documents to train, especially in the early rounds of training, as do some others. I use a variety of methods in my discretion, especially the multimodal search methods such a keywords, concept search, and the like. In text retrieval science this use of human discretion, human creativity and judgment, is called an ad hoc search. It contrasts with fully automated search, where the text retrieval experts try to eliminate the human element. See Mr EDR for more detail on 2016 TREC Total Recall Track that had both ad hoc and fully automated sections. My work with legal search engines, especially predictive coding, has shown that new technologies do not work with the old methods and processes, such as linear review or keyword alone. New processes are required that employ new ways of thinking. The new methods that link creative human judgments (i) and the computer’s amazing abilities at text reading speed, consistency, analysis, learning and ranking (z). 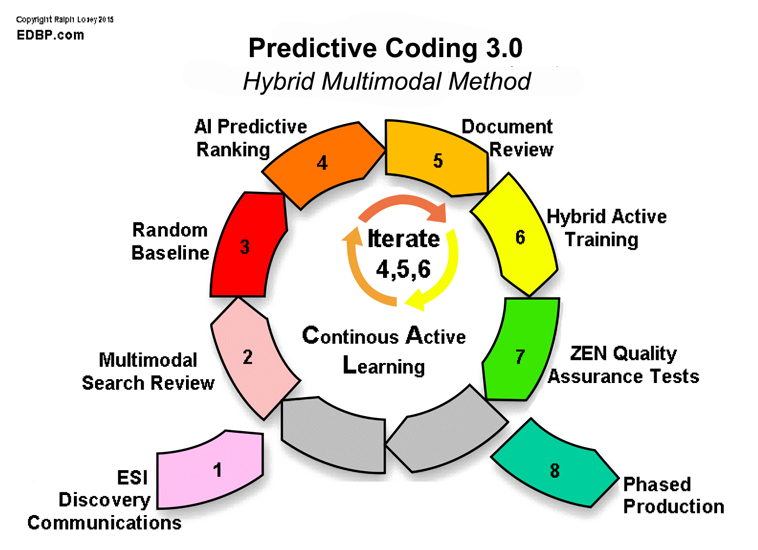 My latest processes, Predictive Coding 3.0, are variations of Continuous Active Training (CAT) where steps four, five and six iterate until the project is concluded. Grossman & Cormack call this Continuous Active Learning or CAL, and they claim Trademark rights to CAL. I respect their right to do so (no doubt they grow weary of vendor rip-offs) and will try to avoid the acronym henceforth. My use of the acronym CAT essentially takes the view of the other side, the human side that trains, not the machine side that learns. In both Continuous Active Learning and CAT the machine keeps learning with every document that a human codes. Continuous Active Learning or Training, makes the linear seed-set method obsolete, along with the control set and random training documents. 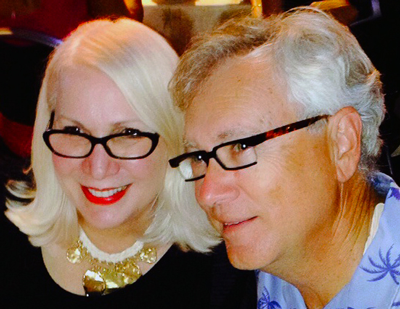 See Losey, Predictive Coding 3.0. I exercise my human judgment and experience to withhold certain training documents. (Note, I never withhold hot trainers (highly relevant documents)). I do this if my experience (I am tempted to say ‘my imagination‘) suggests that including them as training documents will likely slow down or confuse the algorithm, even if temporarily. I have found that this improves efficiency and effectiveness. It is one of the techniques I used to win document review contests. This kind of intimate machine communication is possible because I carefully observe the impact of each set of training documents on the classifying algorithm, and carryover lessons – iterate – from one project to the next. I call this keeping a human in the loop and the attorney in charge of relevance scope adjudications. See Losey, Why the ‘Google Car’ Has No Place in Legal Search. We humans provide experienced observation, new feedback, different approaches, empathy, play and emotion. We also add a whole lot of other things too. The AI-Robot is the Knowledge fountain. We are the Wisdom fountain.That it is why we should strive to progress into and through the Knowledge stage as soon as possible. We will thrive in the end-goal Wisdom state. The first Information stage of the post-computer society in which we live is obviously chaotic. It is like the disconnected numbers that lie completely outside of the Mandelbrot set. It is pure information with only haphazard meaning. It is often just misinformation. Just exponential. There is an overwhelming deluge of such raw information, raw data, that spirals off into an infinity of dead-ends. It leads no where and is disconnected. The information is useless. You may be informed, but to no end. That is modern life in the post-PC era. The next stage of society we seek, a Knowledge based culture, is geometrically similar to the large black blogs that unite most of the figure. This is the finite set of numbers that provide all connectivity in the Mandelbrot set. Analogously, this will be a time when many loose-ends will be discarded, false theories abandoned, and consensus arise. In the next stage we will not only be informed, we will be knowledgable. The information we all be processed. The future Knowledge Society will be static, responsible, serious and well fed. People will be brought together by common knowledge. There will be large scale agreements on most subjects. A tremendous amount of diversity will likely be lost. After a while a knowledgable world will become boring. Ask any professor or academic. The danger of the next stage will be stagnation, complacency, self-satisfaction. The smug complacency of a know-it-all world. This may be just as dangerous as the pure-chaos Information world in which we now live. If society is to continue to evolve after that, we will need to move beyond mere Knowledge. We will need to challenge ourselves to attain new, creative applications of Knowledge. We will need to move beyond Knowledge into Wisdom. I am inclined to think that if we ever do progress to a Wisdom-based society, we will be a place and time much like the unpredictable fractal edges of the Mandelbrot. Stable to a point, but ultimately unpredictable, constantly changing, evolving. The basic patterns of our truth will remain the same, but they will constantly evolve and be refined. The deeper we dig, the more complex and beautiful it will be. The dry sameness of a Knowledgable based world will be replaced by an ever-changing flow, by more and more diversity and individuality. Our social cohesivity will arise from recursivity and similarity, not sameness and conformity. A Wisdom based society will be filled with fractal beauty. It will live ever zigzagging between the edge of the known and unknown. It will also necessarily have to be a time when people learn to get along together and share in prosperity and health, both physical and mental. It will be a time when people are accustomed to ambiguities and comfortable with them. In Wisdom World knowledge itself will be plentiful, but will be held very lightly. It will be subject to constant reevaluation. Living in Wisdom will be like living on the rough edge of the Mandelbrot. It will be a culture that knows infinity firsthand. An open, peaceful, ecumenical culture that knows everything and nothing at the same time. A culture where most of the people, or at least a strong minority, have attained a certain level of personal Wisdom. Back to our times, where we are just now discovering what machine learning can do, we are just beginning to pattern our investigations, our search for truth, in the Law and elsewhere, on new information gleaned from the Chaos theories. Active machine learning, Predictive Coding, is a natural outgrowth of Chaos Theory and the Mandelbrot Set. The insights of hidden fractal order that can only be seen by repetitive computer processes are prevalent in computer based culture. These iterative, computer assisted processes have been the driving force behind thousands of fact investigations that I have conducted since 1980. I have been using computers to help me in legal investigations since 1980. The reliance on computers at first increased slowly, but steadily. Then from about 2006 to 2013 the increase accelerated and peaked in late 2013. The shift is beginning to level off. We are still heavily dependent on computers, but now we understand that human methods are just as important as software. Software is limited in its capacities without human additive, especially in legal search. Hybrid, Man and Machine, that is the solution. But remember that the focus should be on us, human lawyers and search experts. The AIs we are creating and training should be used to Augment and Enhance our abilities, not replace them. They should complement and complete us. The converse realization of Chaos Theory, that disorder underlies all apparent order, that if you look closely enough, you will find it, also informs our truth-seeking investigatory work. There are no smooth edges. It is all rough. If you look close enough the border of any coastline is infinite. The same is true of the complexity of any investigation. As every experienced lawyer knows, there is no black and white, no straight line. It always depends on so many things. Complexity and ambiguity are everywhere. There is always a mess, always rough edges. That is what makes the pursuit of truth so interesting. Just when you think you have it, the turbulent echo of another butterfly’s wings knock you about. The various zigs and zags of e-discovery, and other investigative, truth-seeking activities, are what make them fascinating. Each case is different, unique, yet the same patterns are seen again and again with recursive similarity. Often you begin a search only to have it quickly burn out. No problem, try again. Go back to square one, back to zero, and try another complex number, another clue. Pursue a new idea, a new connection. You chase down all reasonable leads, understanding that many of them will lead nowhere. Even failed searches rule out negatives and so help in the investigation. Lawyers often try to prove a negative. The fractal story that emerges from Hybrid Multimodal search is often unexpected. As the search matures you see a bigger story, a previously hidden truth. A continuity emerges that connects previously unrelated facts. You literally connect the dots. The unknown complex numbers – (a + bi) – the ones that do not spiral off into the infinite large or small, do in fact touch each other when you look closely enough at the spaces. I am no Sherlock, but I know how to find ESI using computer processes. It requires an iterative sorting processes, a hybrid multimodal process, using the latest computers and software. This process allows you to harness the infinite patience, analytics and speed of a machine to enhance your own intelligence ……. to augment your own abilities. You let the computer do the boring bits, the drudgery, while you do the creative parts. The strength comes from the hybrid synergy. It comes from exploring the rough edges of what you think you know about the evidence. It does not come from linear review, nor simple keyword cause-effect. Evidence is always complex, always derived from chaotic systems. A full multimodal selection of search tools is needed to find this kind of dark data. The truth is out there, but sometimes you have to look very carefully to find it. You have to dig deep and keep on looking to find the missing pieces, to move from Information → Knowledge → Wisdom. This entry was posted on Friday, May 20th, 2016 at 3:30 pm and is filed under Evidence, informaton, knowledge, Lawyers Duties, Review, Search, Technology, wisdom. You can follow any responses to this entry through the RSS 2.0 feed. Both comments and pings are currently closed.